It’s odd, but Samsung has launched a new app, and it’s called Marshmallow. While it has nothing to do with the version six of Android operating system, the Marshmallow app does cater to Samsung’s users with some productivity features. 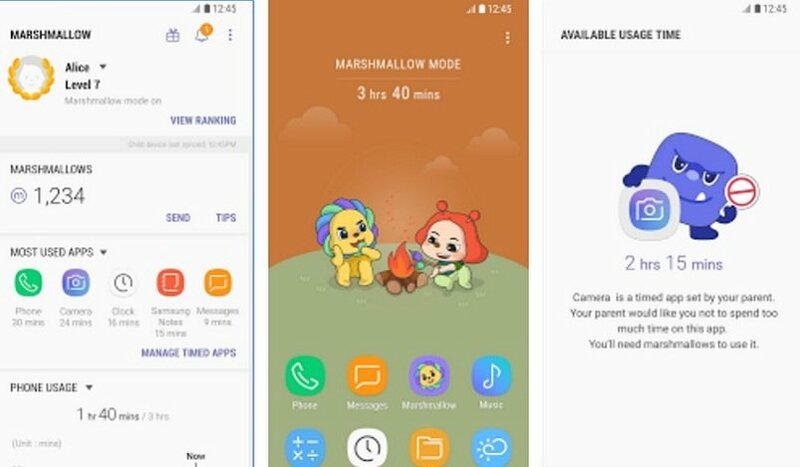 Marshmallow is essentially a parental control app, but Samsung wants you to see the app as more than just that. In addition to allowing some parental controls on a device, the app is also designed to teach children proper smartphone usage habits. The app is available on Google Play Store. With the Samsung Marshmallow app, parents can set bedtimes, limit internet time, block apps, among other controls. The app also takes things a step further by enticing your kids to be better users of smart devices. There is a reward system in place, too – kids can earn points with good online behavior, while the ones who break rules, or rather don’t follow them, will cause a loss in points. After getting enough points, the child can ask parents for a card to use in the gift shop. Although, do note, considering it’s called Samsung Marshmallow, it’s an app exclusive to Samsung and will not be available for other Android users. The app will be supported on the new Galaxy S8 duo, last year Galaxy S7 and Galaxy S7 Edge, the Galaxy S6, the Galaxy S6 Edge, Galaxy S6 Edge Plus, the Galaxy S5, Galaxy Note 5, Galaxy Note 4, Galaxy A5, Galaxy A7, Galaxy A8, Galaxy A9, and the Galaxy J3, Galaxy J5, and Galaxy J7. Interestingly, Samsung has lately been working on a couple of exclusive apps. Just last week, Samsung announced the In-Traffic Reply app, which automatically responds to text messages when you’re in the car or riding a bike. And to detect that you are in a moving car or bike, the app relies on phone sensors and GPS. The automatic replies are an essentially preset reply to incoming texts. Current time: 04-25-2019, 08:03 AM Powered By MyBB, © 2002-2019 MyBB Group.